Environmental, Health and Safety News: #2014MatchDay Help the #hungry today by retweeting! #FF #Donate! #2014MatchDay Help the #hungry today by retweeting! #FF #Donate! Just wanted to send out a quick reminder that today is Match Day! 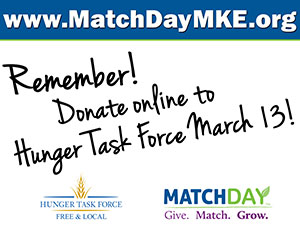 Hunger Task Force’s social media campaign is underway, and you can out by retweeting, liking, and sharing “Match Day meme” posts throughout the day. Their phone bank is also live at 4:30am, and folks can call (414) 939 MEAL to donate!